Within this study, the Western Mediterranean sea basin includes the Mediterranean coastlines belonging to Spain, France and Malta, as well as the portion of Italian coastlines along the Thyrrenian Sea and Strait of Sicily. The Western Mediterranean basin benefits from a number of strengths related to its strategic positioning, among which the fact that it is part of one of the principle maritime corridors in the world and the gateway to Africa for European countries. However, in the West Mediterranean sea basin, a specific political framework has yet to be developed for promoting and supporting cross-border and cross-sectorial maritime spatial planning. Instead, cross-border MSP initiatives have so far been created mainly at pan- Mediterranean level through ad hoc projects. Western Mediterranean EU Member States share the sea-basin with Morocco and Algeria. The Western Mediterranean is a traditional and consolidated tourist destination in the region, in particular its northern rim. Taken together, fisheries and aquaculture are the second most important activity in terms of GVA and employment. Goods transport (circa 700 million tons freight and 14 million TEU traffic) represent close to 40% of Mediterranean values. Blue Plan Regional Activity Centre (BP/RAC), France, contributing to raising awareness of Mediterranean stakeholders and decision makers on environment and sustainable development issues, in particular through assessment of the current state and development of future scenarios. Priority Actions Programme Regional Activity Centre (PAP/RAC), Croatia, focusing on the sustainable development of the Mediterranean's coastal areas, including in particular the implementation of the Protocol on Integrated Coastal Zone Management (ICZM) in the Mediterranean. Specially Protected Areas Regional Activity Centre (SPA/RAC), Tunisia, assisting Mediterranean countries in implementing the Protocol concerning Specially Protected Areas and Biological Diversity in the Mediterranean. Regional Marine Pollution Emergency Response Centre for the Mediterranean Sea (REMPEC), Malta, assisting the Mediterranean coastal States in ratifying, transposing, implementing and enforcing international maritime conventions related to the prevention of, preparedness for and response to marine pollution from ships. Information and Communication Regional Activity Centre (INFO/RAC), Italy, providing adequate information and communication services and infrastructure technologies to Contracting Parties to implement Article 12 on public participation and Article 26 of the Barcelona Convention on reporting. Sustainable Consumption and Production Regional Activity Centre (SCP/RAC), Spain, a centre for international cooperation with Mediterranean countries on development and innovation in the production sector and civil society, based on more sustainable consumption and production models. Finally, The MED POL Programme is responsible for the follow up work related to the implementation of the LBS Protocol, the Protocol for the Protection of the Mediterranean Sea against Pollution from Land-Based Sources and Activities and of the dumping and Hazardous Wastes Protocols. UNEP/MAP was firstly created to address marine pollution issues and includes now integrated coastal zone spatial planning (ICZM) and ecosystem-based management (EBM). Within ICZM and EBM, it promotes MSP, for example through the Coastal Area Management Programmes (CAMPs) managed by PAP/RAC. SPA/RAC is active in the field of MSP with some joint actions with the EC to promote establishing SPAMIs (Special Protected Areas of Mediterranean Interest) in open seas, including deep seas (MedOpenSea project). In addition to that, it is involved in other actions targeting the definition of EBSAs (Ecologically and Biologically Significant Areas) in the Mediterranean, under the framework of the Convention for Biological Diversity (CBD). The first meeting of the Working Group on IMP-MED took place in December 2009. It gathers representatives of the EU and its Member States together with non-EU Mediterranean countries for discussing and reviewing the implementation of the IMP-MED project, which aims at promoting an integrated approach for maritime management within the Mediterranean through regional meetings, technical regional workshops and technical assistance. The CPMR Intermediterranean Commission was created in Andalusia in 1990 to express the shared interests of Mediterranean regions in important European negotiations. 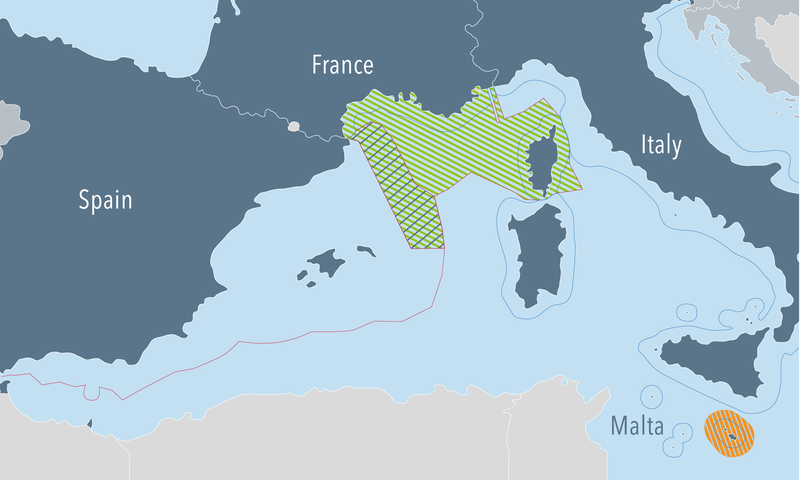 The principal mission of the Intermediterranean Commission is to encompass the issues raised in all the Regions bordering the Mediterranean Sea, in particular after the 1995 Barcelona declaration. Today, the Intermediterranean Commission has forty Member Regions in 9 different countries (Cyprus, France, Greece, Italy, Malta, Morocco, Portugal, Spain and Tunisia). Its purpose is to be open to all the different sub-national levels in all Mediterranean countries. In December 2014, the CPMR Intermediterranean Commission set a working group on Transport and Integrated Maritime Policy to support regional authorities in improving governance and coordination in the implementation of EU maritime and transport policies in the Mediterranean. Themes covered include MSP. The Union for the Mediterranean is an intergovernmental organisation aimed at bringing together the 28 EU MS and the 15 southern and eastern Mediterranean countries, to enhance regional cooperation and dialogue in the Euro-Mediterranean region. Established in 2008 under the French Presidency of the EU, it built on processes that had emerged and achieved progress in the previous years, notably the Euro-Mediterranean Partnership (EMP). The creation in 1996 of the MCSD by the Contracting Parties conveys their commitment to sustainable development and to the effective implementation, at the regional and national levels, of the decisions of the Earth Summit and the United Nations Commission for Sustainable Development. The MCSD is made up of 40 members: 22 permanent, representing each of the Contracting Parties to the Barcelona Convention, as well as 18 rotating representatives from wider community. The MCSD has provided major inputs to the formulation of the Mediterranean Strategy for Sustainable Development (MSSD) and spearheads its implementation at the country level. The Strategic Partnership for the Mediterranean Sea Large Marine Ecosystem (MedPartnership) is a collective effort of leading environmental institutions and organizations together with countries sharing the Mediterranean Sea to address the main environmental challenges that Mediterranean marine and coastal ecosystems face. The MedPartnership is being led by UNEP/MAP and is financially supported by the Global Environment Facility (GEF), and other donors, including the European Commission and all participating countries. MIO-ECSDE is non-profit Federation of over 130 Mediterranean Non-Governmental Organizations (NGOs) working in the fields of Environment and Development in 25 countries of the Euro-Mediterranean area. MIO-ECSDE mission is to protect the natural environment and cultural heritage and promote sustainable development in a peaceful Mediterranean by bringing together the efforts of environmental and developmental NGOs. The Bologna Charter is a policy document aiming at strengthening the role of coastal administrations in the context of European policies and initiatives at the Mediterranean scale related to: coastal protection, integrated management, adaptation to climate change. The Charter also promotes and outlines a Macro-Project initiatives for the current programming period of the European Structural Funds (2014-2020), designed for a coherent Mediterranean macro-thematic and multi-sectoral strategy. The Macro-Project is detailed in the Joint Action Plan. Although the main focus is on coastal planning, management and adaptation to climate change, MSP approaches and principles are clearly considered relevant and taken in consideration by the Charter and the Action Plan. The International Network of Basin Organizations has as main objectives to: (i) develop permanent relations with the organizations interested in comprehensive river basin management, and facilitate exchanges of experiences and expertise among them; (ii) promote the principles and means of sound water management in cooperation programmes to reach sustainable development, (iii) facilitate the implementation of tools for institutional and financial management, for programming, for the organization of data bases, and of models adapted to the needs. The main objective of AViTeM is to establish a mechanism for the exchange of experience, expertise, cooperation and training, to enable promotion of integrated and exemplary initiatives of urban and territorial development in the countries of the Union for the Mediterranean. It is a response to strong demand of cooperation from Mediterranean countries in the areas of processes, tools and methods, for the implementation of effective urban and territorial planning against a backdrop of regionalisation and decentralisation. The 5+5 ministerial meetings is an intergovernmental cooperation initiative between Malta, Italy, France, Spain, Portugal, Mauritania, Morocco, Algeria, Tunisia, and Libya. It was launched in 1990. 5+5 is steered through Ministerial Conferences of ministers of Foreign Affairs. There is no permanent secretariat. In principle, the 5+5 Dialogue covers any cooperation field between partners. A five-nation sub-region grouping that brings together Algeria, Libya, Mauritania, Morocco and Tunisia working on several issues related to the promotion of economic integration in the Maghreb, especially the creation of the proposed Maghreb Bank for Investment and External Trade and launching a Maghreb free zone.